Bedroom Layout: On the main floor there is a large bedroom with 2 sets of twin over twin bunk beds and a king size bed. In this room is also a bathroom with a shower and an ensuite vanity area. 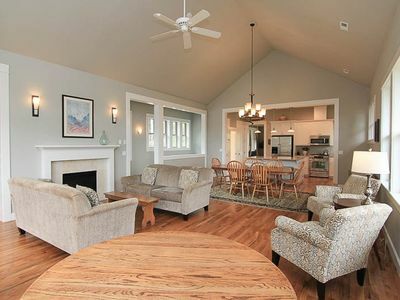 On the upper floor there are two smaller bedrooms. 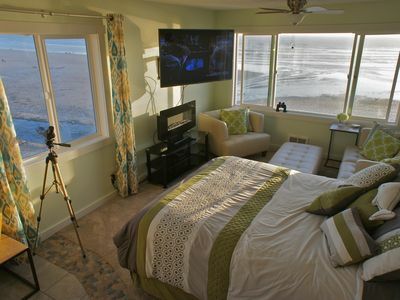 One bedroom has two twin beds and the other bedroom offers an amazing ocean view at the foot of a queen size bed. Kitchen: The kitchen is compact and galley style. 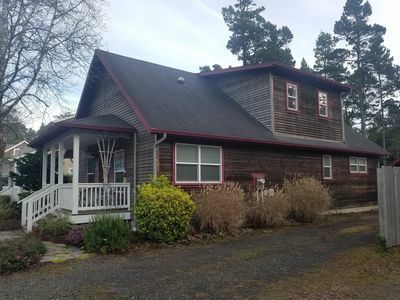 The kitchen is located on the main floor and is fully equipped with a refrigerator/freezer, dishwasher, oven/stove, toaster, coffee maker, Keurig, coffee bean grinder, blender, hand mixer, and other cooking amenities. For additional cooking pleasure, you will find a gas AND charcoal grill on the deck. Bathrooms: Both bathrooms are on the smaller size in keeping with the style of the home and are located on the main floor of the house. One bathroom is located within the main floor bedroom and offers a shower and extended vanity area with cabinets and a drawer. The second bathroom has a built-in storage cabinet, bathtub (no shower) and a pedestal sink. Pets are welcome! 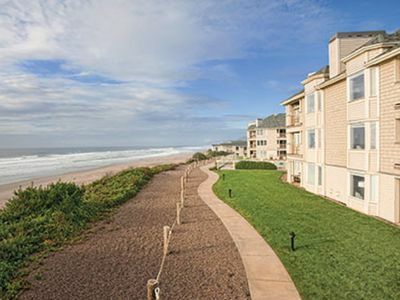 Amenities for your furry friend include pedestal food & water dishes, treats, balls for the beach, and pick up bags. 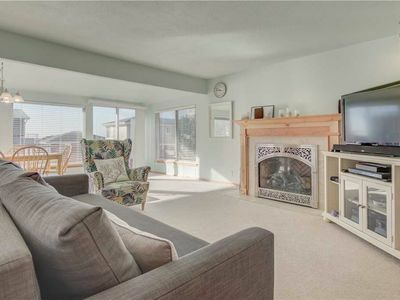 Our large deck is gated so that you can open up the family room sliding glass doors and allow your dogs to come and go from the house to deck as they please. 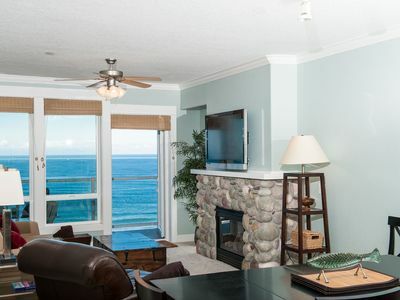 MAGENTA SHORES is a delightful beach home that has been beautifully remodeled. 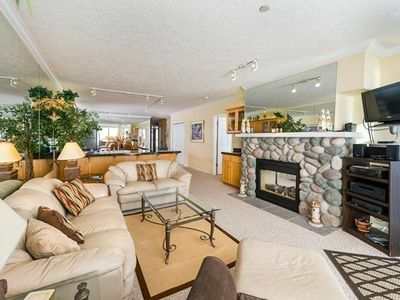 The floor plan reflects the owners' desire to maintain the true beach house feeling. 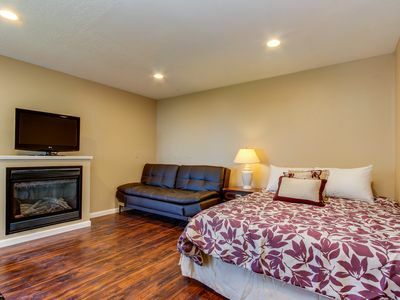 It has one large bunk room downstairs and two smaller bedrooms upstairs. The bathrooms have been updated, they are fresh and clean and on the smaller size. 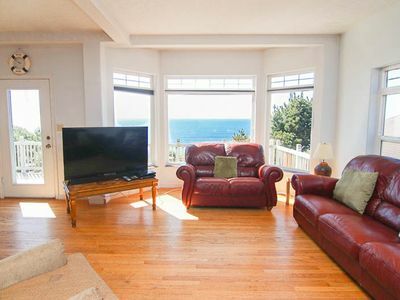 The beach home has a cozy feeling with a roaring fire in the main living area and 180 degree unobstructed views of the ocean. 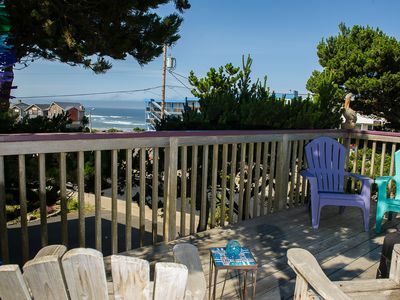 Walking out from the main living area is a very large deck, great for whale, sea lion, and wave watching during the day and star gazing at night. The deck also offers a charcoal AND gas grill for your grilling pleasure. 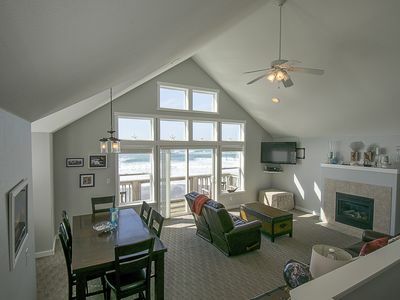 The owners strive to provide a personal, relaxing, comfortable, clean, environment for you and your family to enjoy an authentic beach house experience. 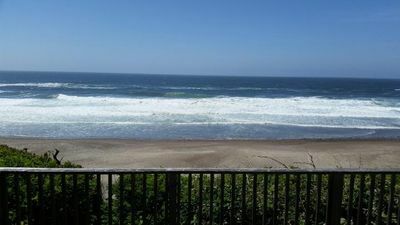 Gleneden Beach, a small town 5 miles south of Lincoln City, has a few restaurants (such as the fantastic Side Door Cafe), small shops, and a grocery store, but the real attraction is the stretch of uncrowded, pristine coastline. 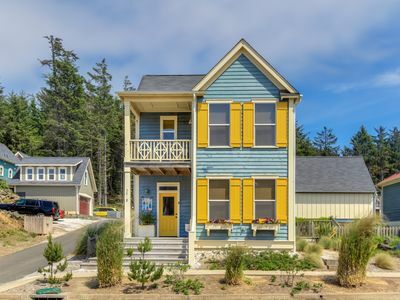 This home is ocean front and has beach access just 100 feet away! 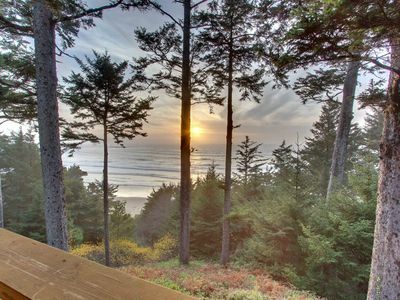 You can easily drive north to Lincoln City or south to Depoe Bay, though with the beach so close and with amazing views right from the comfort of the living room, deck, and master bedroom, you may not want to leave this terrific home! 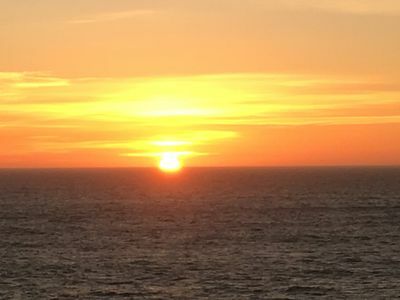 Message from Derek: "I periodically watch the footage to help relax during my breaks at work. 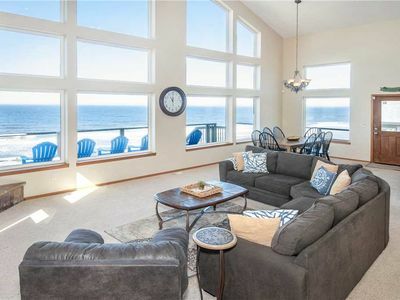 It has a bit of everything: ocean sounds, sun setting in the distance, people walking on the beach, etc..."
'Coast Busters' Luxurious Oceanfront Penthouse with all the Bells and Whistles! 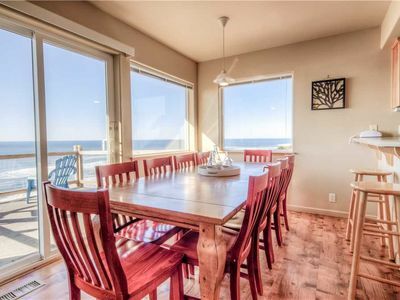 Oceanfront home w/ amazing views - walk right to the beach! *Promo! 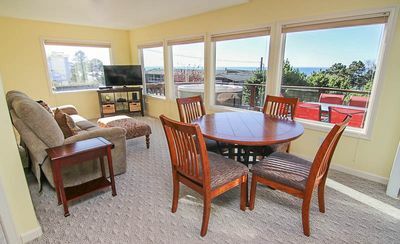 * Top Floor Oceanfront Condo, Private Hot Tub, Pool, Wifi and Much More! 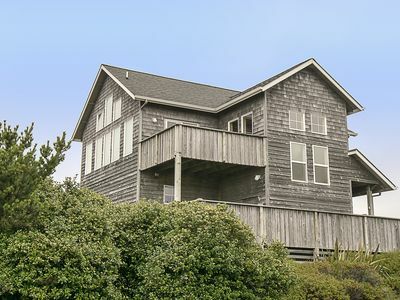 Luxury Oceanfront Home With Hot Tub, Game Room and Spectacular Deck! 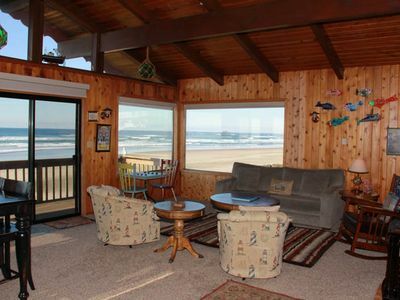 Updated Depoe Bay Charmer has Wood Fire, Oceanview, Hot Tub & Allows Pets! 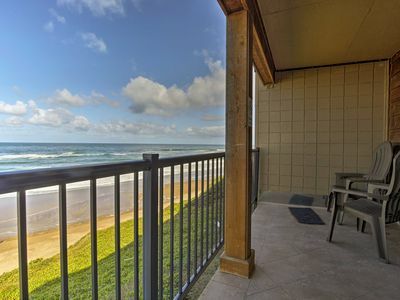 Watch Surfers From This Large OCEAN FRONT Home!